High-throughput computing — the shared utilization of autonomous computational resources toward a common goal — is being brought to bear on massive UW-Madison research challenges. Recent examples include a study on the dynamics of galaxies, from formation to death; a simulation of the optimal parameters for engine efficiency; and an effort to improve cochlear implants by analyzing how the brain processes sound. Our facilitation model is bridging a gap between the scientific goal and the best way to harness computation to achieve that goal. We are doing roughly 120 projects a year, using more than 150 million hours of computing time, with many growth opportunities emerging in biomedicine, the humanities and social sciences. We work to foster collaboration with global partners in the public and private sector. 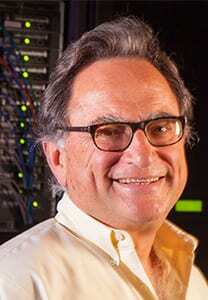 Core Computation Director Miron Livny’s center is driven to advance data intensive science through high-tech computing. Livny serves both the Morgridge Institute and the Wisconsin Institute for Discovery by providing the advanced computing tools and infrastructure necessary to facilitate the leading-edge work of scientists in both institutes. Livny, a UW-Madison professor of computer sciences and director of the UW-Madison Center for High Throughput Computing, specializes in distributed computing and will continue his work with researchers around the world to advance computer and data intensive science. What is High Throughput Computing?